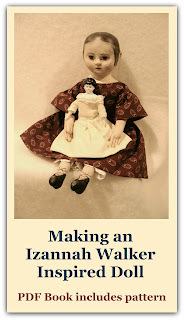 If the oral tradition concerning Izannah Walker is true, she had likely been making dolls since the 1840's. Monica Bessette owns a tintype dating to 1858 which shows a child holding an Izannah Walker doll. 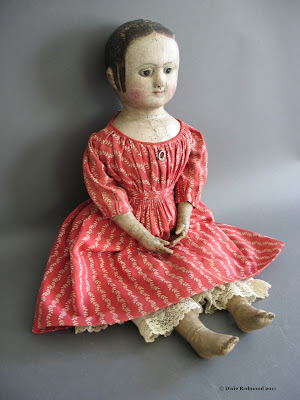 If Izannah had been making dolls by 1858, why did she wait at least 15 years to apply for a patent? 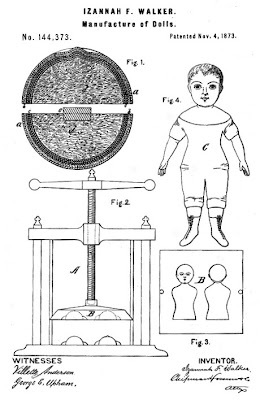 Women were allowed to patent inventions under the Patent Act of 1790, but in many states women could not legally own property independent of their husbands. This might have been a barrier for some women applying for patents. What’s the point of applying for a patent if you can’t own the company that makes the profit from your invention? To get around this, when women had ideas, the patents were applied for in the name of a brother or father, to keep the invention and possibility for profit within the family. Rhode Island at the time was restrictive regarding suffrage for white males, never mind women and people of color. By the early 1840s the voting population of males had been reduced by one half of the population, because men were required to own $134 freehold in order to vote. It is likely that this restrictive suffrage environment might have made it challenging for the small business owner in Rhode Island. This is the climate in which Izannah, a woman, lived, invented and created. Many of you who read this blog are women who have small businesses of your own. You are doll makers, shop owners, pattern makers. You understand the amount of thought, creativity and follow-through it takes to be a working artist and business person. Imagine trying to run your business and not be allowed to own it. Imagine developing an idea and having to pass it off as your brother’s or father’s invention. In 1869, the National Woman Suffrage Association (NWSA) was formed in New York. I wonder what newspapers Izannah read, and if news of this movement fueled her views about her own work and life? The fact that Izannah did eventually apply for the patent in her own name tells us something about Izannah. At the age of 56, she was successful enough to take the time and money to pay a lawyer to apply for a patent. It tells us that she thought it was important to claim her creation as her own. And perhaps her application of a patent in her own name makes a statement about women as contributors in the American society in which she lived. I really can't imagine not being able to own my own business or having to pass it off under a male relative's name. Thank you for the insight in this post, I respect Izannah for patenting her work in her own name!